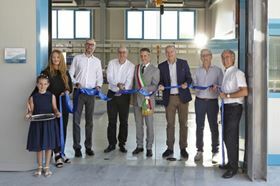 Cutting the ribbon at the new Xylem Innovation Center in Montecchio Maggiore, Italy. Located in Montecchio Maggiore, Vicenza, the new Xylem Innovation Center has been designed to further the understanding of how system efficiency can be optimized by analyzing a pump’s connectivity with a building control system. “The opening of this innovation centre marks an important milestone in our R&D journey. As green buildings become the rule rather than the exception, it is crucial to help our customers understand the environmental and economic benefits of ensuring entire systems are highly efficient, and not just individual components,” said Amedeo Valente, director of Innovation and Technology with Xylem’s Applied Water Systems business. “For a building to be truly green, components need to be able to communicate with each other so that adjustments can be made in real-time to deliver maximum efficiency. Our ambition is to drive even greater interconnectivity across systems, enhancing energy efficiency, further reducing the life-cycle costs of our products and ultimately, delivering cost-savings for customers. The deployment of Internet of Things (IoT) technologies – connecting pump components through IoT to turn traditional pumps into smart pumps – is expected to increase operational efficiency by nearly 45% and widen application scope,” added Valente. The new Xylem Innovation Center builds on the company’s research capabilities, which include R&D centres in Sweden, Germany and Italy.